Reprinted by Unpopular Books, London, March 1989. A few days after the termination of the Arab strike and revolt in Palestine, two unsuspected and harmless Arabs, passing thru the Jewish town of Tel Aviv in a carriage were fired at and wounded by "unknown assailants". Unknown for the reason that they escaped. Everybody, including the police, knows that they are to be found in the ranks of the "Revisionists" or extreme Zionist nationalists who have never concealed their liking for "direct action" and terrorism Needless to say, they are very vocal, but hardly convincing, in proclaiming their innocence and talking of "Marxist calumnies". Yet the fight against the Arabs, a fight in which all means may be employed, is one of the guiding principles of Revisionism which has justly earned the name of Zionist Fascism. And it deserves to be noted that the Tel Aviv outrage was preceeded by statements from authoritative Revisionist sources which are near to advocating the employment of terrorist tactics. In a statement on the situation in Palestine, made on Sept. 9, 1936, Vladimir Jabotinsky, Duce of Jewish Fascism, said: "During the first weeks of the struggle, the exercise of restraint served a useful purpose. It showed that the Jew, when armed, is content to defend himself and does not attack and try to revenge himself. For this reason, I vetoed all thoughts of retaliation; but now I consider it my duty to proclaim that I have withdrawn my veto". This unmistakable signal for terrorism was supplemented a few days later by a statement from the Viennese organ of the Revisionists, the "Nation", referring to the situation in Palestine: "It happens nowadays that Jewish newspapers in Palestine publish reports, hidden away in small type between unimportant news, of Arabs killed here and there in Palestine, of Arabs wounded, of Jews arrested and acused, etc. Jewish papers published outside of Palestine go even farther in hiding facts. They talk of Arabs being killed by Arabs. What is the good of all this eyewash? Is it our fault that the world forces us to go its ways? The world today understands no language but that of guns, machine guns and pistols. Now we too begin to learn this language. Let it not be forgotten that ours is a talented people. We have aready learned many lessons. The time has come to learn the language of fire and blood". The shots in Tel Aviv provide the echo to this incitement. The Jews are no chosen people. They are, in one respect, like other nations under capitalism, so much so, that there is even a Jewish brand of Fascism. This may surprise the casual observer who is inclined to regard Fascism as a kind of Anti-semitism, or, at least, as bound up with Anti-semitism. But it must be remembered that classical Fascism, that of Mussolini, was never Anti-semitic. Fascism is an international epidemic, although in each case profoundly nationalistic. Its roots are basically the same in all countries, and is worth noting that the epidemic has not stopped at the doors of the ghetto or at the border of Palestine. Their abnormal situation favored the spread of the disease. To the fearful economic need to which they are subjected in all countries of eastern Europe,and in Germany, are also added national persecution, the withdrawal of political rights and even brutal physical terror. While the class-conscious workers among them take part in the social struggle of these countries with a view to solving their own national problem as a by-product of the victory of Socialism, the pressure to which they are subjected generates an inflated nationalism among the numerous petty-bourgeois elements. The fact that many countries which heretofore absorbed Jewish emigrants are now closed to them (U.S.A., Canada, South America), creates the impression that Zionism is the only solution and Palestine their "Promised Land". To them, immigration into Palestine means hopes of a better tuture. Each time Zionism shows itself to be incompatible with reality, the more the demagogues find a fertile field. To the desperate masses, all kinds of quack medicine is appealing. Take for instance the plan recently proposed by the Revisionists which provides for the settlement in Palestine "on both sides of the Jordan" of one and a half million Jews within the next ten years. Obviously this widely advertised plan, which is presented with much ballyhoo, is manifestly absurd. Yet Jabotinsky is hailed as a Messiah by many of the impoverished eastern Jews who cling to every straw. In regard to Palestine itself, the majority of the Jews who come here are sincere in proclaiming the need of a "restrafication" [restratification?] of the Jewish people. By turning former traders, middlemen and "air"men into productive agricultural and industrial workers, the social structure of the Jewish people will be profoundly altered; the Jews are to be "Normalized", to use the current phrase. This idea, which is essential to Zionism, as to every other nationalism, is often supplemented by vague concepts of a socialist society in Palestine. But there is another group of immigrants composed of traders, middlemen and other unproductive elements unwilling to adjust their lives to the new conditions. To this latter group, Palestine is merely a haven in which to continue their parasitic role. This group within the Jewish community and the Zionist movement, struggling to preserve its identity as being distinct from the working class, is the social basis of Jewish Fascism. Jabotinsky stands for a "revision" of official Zionism which he accuses of "national treason" and - "Marxism"! The methods are always the same... The Revisionists accuse the Zionist Executive of "being the agency of Arab and Supposed British, rather than of Jewish, interests". They are nationalist diehards, hundred percenters. To them official Zionism is "the renunciation of Zion". Their minimum program provides for the establishment of a Jewish State on both sides of the Jordan, i.e. including the mandated territory of Transjordan, and based on a Jewish majority in the country. Firmly convinced "that there can be no spontaneous reconciliation with the Palestine Arabs, neither now nor in the future", Jabotinsky rejects the idea of a political parity between the two peoples and demands the creation of a Jewish military force as an indispensable condition for the realization of his aims. "Zionism is impossible without a Jewish Legion... The whole Jewish people must become a people in arms. " The setting up of this Legion is also declared by the Revisionists to be "a prime necessity for the security of the British Empire". At the same time, they declare themselves ready to proceed "with, without or against the British". This flexible formula hides a pro-Italian tendency which has of late become more marked. The military formations of the Revisionists (strangely enough their shirts are brown) are regarded as the nucleus of the Legion whose purpose it is to break by force the opposition of the Arabs to Zionist penetration and to establish a "fait accompli" and possibly more than one. It has often been remarked that there exists a close resemblance between the phraseology of Zionist Revisionism and that of German National Socialism. But the resemblance is not only one in words. The Revisionists fight "the increasing preponderance of the workers' organizations". They protest against the subsidies given by the official Zionist movement to settlements maintained by the Jewish workers. They insist that private initiative is more important than public funds. The Zionist labor movement is accused of "intransigence and lust of power", "unnecessary insistence on social conflicts", "dogmatic application of the class struggle theory which derives from Europe". All this is the more absurd since every objective observer is forced to admit that extreme nationalism is the beginning and the end of the policy pursued by the Jewish Labour Federation in Palestine. This policy is made completely subservient, in theory as well as in practice, to Zionist nationalism and renounces everything remotely connected with independent class politics. In spite of these well-known and unassailable facts, the ultra-moderate trade unions which make up the bulk of the Zionist Labor Party, are accused by the Revisionists of'Marxist and Bolshevist tendencies as well as of "sacrificing ideals to the golden calf." Compulsory labor arbitration is demanded in order to ensure the "subordination of all particular interests to the prime necessities of national unity." Is it not obvious that, if anything, this program "derives from Europe"? The Revisionist organization was founded in April 1925 , by Vladimir Jabotinsky, a Russian Zionist journalist, who had organized a corps of Jewish volunteers in Alexandria during the world-war to serve on the Gallipoli front. Even at that early date he stood for power politics, first against Turkey, for some time against England, always against the Arabs and the workers. In 1920, Jabotinsky, then lieutenant, was expelled from Palestine by the British for organizing illegal formations. In 1923 he made a pact, behind the back of the official Zionist Organization, with the representative of the Ukrainian "White" General and ferocious Jew baiter Petlyura, for the creation of a Jewish corps within the frame-work of an anti-bolshevist White Guard in the Ukraine. When the intrigue leaked out, violent protests were made by the Jewish labor organizations compelling Jabotinsky to resign from the Executive of the Zionist Organization. This gave the 'enfant terrible' his chance to play his messianic role with a vengeance. He became a "leader" and, copying the Hitler movement, built up a strictly authoritarian and militarist organization based on centralized direction, the "Leader principle", and an incredible cult of the personality of the "Leader". The adherents of the movement in Palestine, supplemented by recruits from the backward Oriental Jews, carry on a campaign against the Socialist workers which far outstrips even their terroristic offensive against the Arabs. In Palestine, too, the "extermination of Marxism" is on the agenda. Here too the workers' organizations are to be "smashed". The Revisionists organized strike breakers, their activities resulting in pressing on the wage standard. Parading their Brown-shirts thru the streets, they did everything to provoke the workers. They attacked meetings (a meeting in honor of Brailsford, the English Socialist, was bombarded with stones by their hooligans) and organized gangs to beat up political opponents. Some years ago terrorist groups belonging to their party were discovered in Jerusalem and in Tel Aviv. In 1933 the Revisionist speakers and newspapers conducted an incredible campaign of slander, on the lines of the recent Salengro campaign in France, against Dr. Arlosoroff, then leader of the Labor Party and prominent member of the Zionist Executive. On June 15, the Revisionist Organ culminated its "mud-slinging' campaign by depicting him as a"traitor to the Jewish People, its honor and security". Thirty hours later he (Dr. Arlosoroff) was dead - assassinated in Tel Aviv, the 100% Jewish town. Similar tactics are employed outside of Palestine. The spread of anti-semitism is welcomed by the Revisionists. They do not fight it. Rather they utilize it to further their own ends. While a wave of persecution and torture swept Germany after the Hitler coup, Jabotinsky made a speech in public in Berlin which was nothing less than a wholesale indictment of the Socialists within the Zionist movement. The aforementioned Hebrew Organ of the Revisionists, the "Hasit Ha'am", 1933, glorified Hitler and presented his movement as a shining example to Zionism. They admire Mussolini and Franco. In Germany the Revisionists carried out raids on labor clubs. In other countries they perform attacks on Socialists. In other words, the peculiar "spirit" and methods of the Brownshirts are shown to be quite compatible with Judaism. Revisionism proper might be described, to use a mathematical formula, as "Zionism plus Hitlerism", or as "Hitlerism minus Anti-semitism". 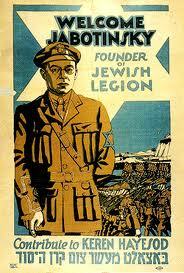 In 1925 Jabotinsky was able to muster four followers at the Zionist Congress. In 1933 his followers captured twenty per cent of the total poll and sent forty-five delagates to the Congress. Two years later, they left the Zionist Organization and held a separate convention at which, according to their own reports, delegates representing 700,000 members of the "New Zionist Organization" participated. The Arab revolt of 1936 was a godsend to these Fascists leading as it did to a wave of chauvinism among the Jews. The Revisionists are doing everything to make capital out of this fact. They are playing a dangerous game, since to them "a world war would be the best chance of realizing the Zionist maximum". Their aim is to become universally recognized as the standard bearers of Zionist intransigence and maximalism. Their slogan continues to be:"Judea must be reborn with fire and blood."